A few weekends ago, I picked up my travel stitching bag to take to the beach. I was rummaging around in it to make sure I had everything and I pulled out my piece I had started at Jessie Chorley’s workshop while we were in England. I had intended to write about this lovely day months ago but life has been extra busy so I’ve just pecked out this story over the week to share. The memories of this special day are just as crisp and the warm feeling it gives me are just like my cup of coffee I’m sipping on. Special moments are long-lasting, thankfully so. I guess it was about this time last year that I stumbled upon this stitching workshop. I was looking for things to do around Newark-on-Trent as we were going to be there for the flea market. We only had a day or two and wanted to find some things to do in the area. I DID think to google workshops. 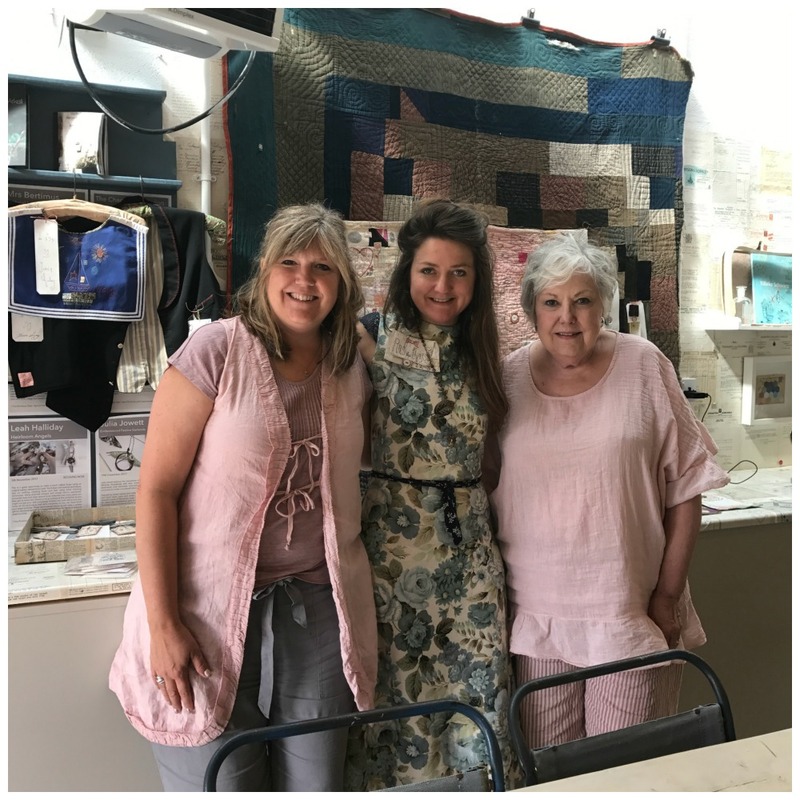 England has a really great community of local artisans, especially textile artisans, and many workshops and fairs hosted in quaint little places. This is how I found Hope and Elvis. A lovely studio located within the grounds of the Welbeck Estate. 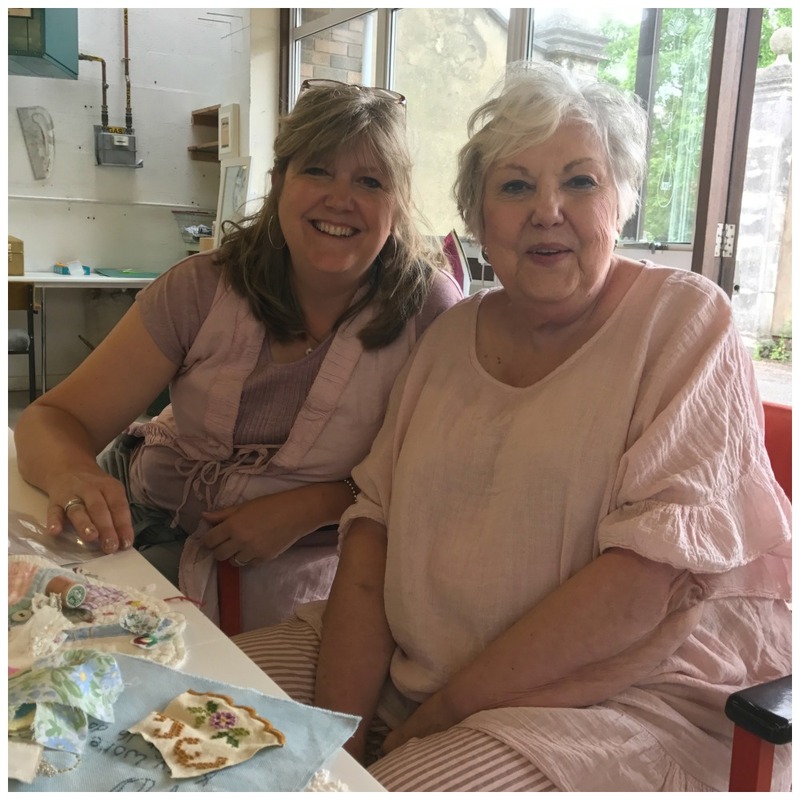 The studio is situated within the grounds of Welbeck Estate, North Nottinghamshire that is part of the Harley Foundation. Founded in 1977 by the late Ivy Duchess of Portland it funds the Harley Gallery and offers subsidised studios to artists, makers and restorers. Set in the northern most tip of the Sherwood Forest, an area know as the Dukeries, Welbeck is steeped in natural beauty and fascinating history, and makes an ideal weekend escape. Doesn’t that sound like an ideal place! And what a great idea of the Duchess of Portland! So back to googling, I found Hope and Elvis and scrolled down her list of Workshops to the dates we would be there. 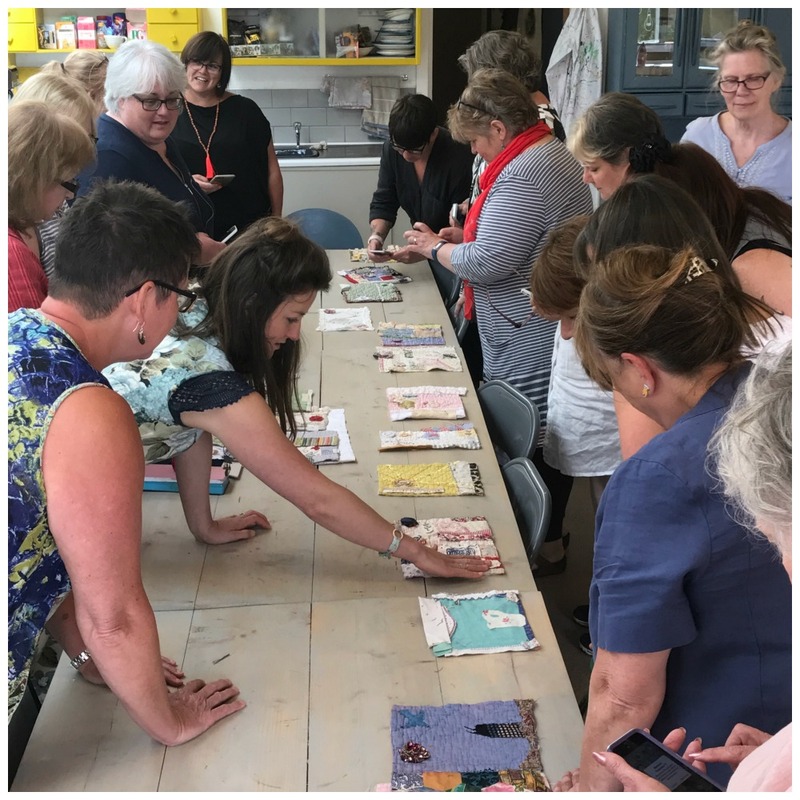 When I saw Jessie Chorley’s workshop on the very weekend we were going to be in Newark-on-Trent I nearly came unglued! (Jessie goes to the flea market in Newark so she incorporates the workshop as the same weekend.) I can remember my heart racing and I couldn’t send an email fast enough to find out if there were any openings. In the world of Instagram, our little world gets so small and acquainted with like-minded people from all across the globe. It’s a happy place where we share photos of things in our lives that we find beauty in and we receive encouragement from one another. In this little world I found (along with lots of folks) Jessie Chorley. I imagine I’ve been following her for at least 3 years on Instagram. 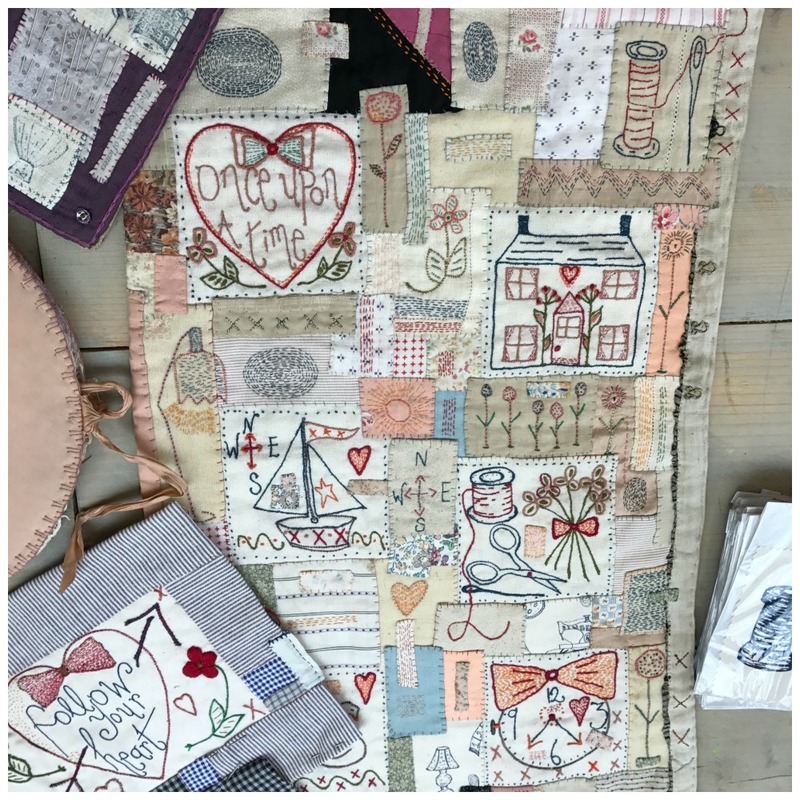 She is an amazingly creative textile artist. 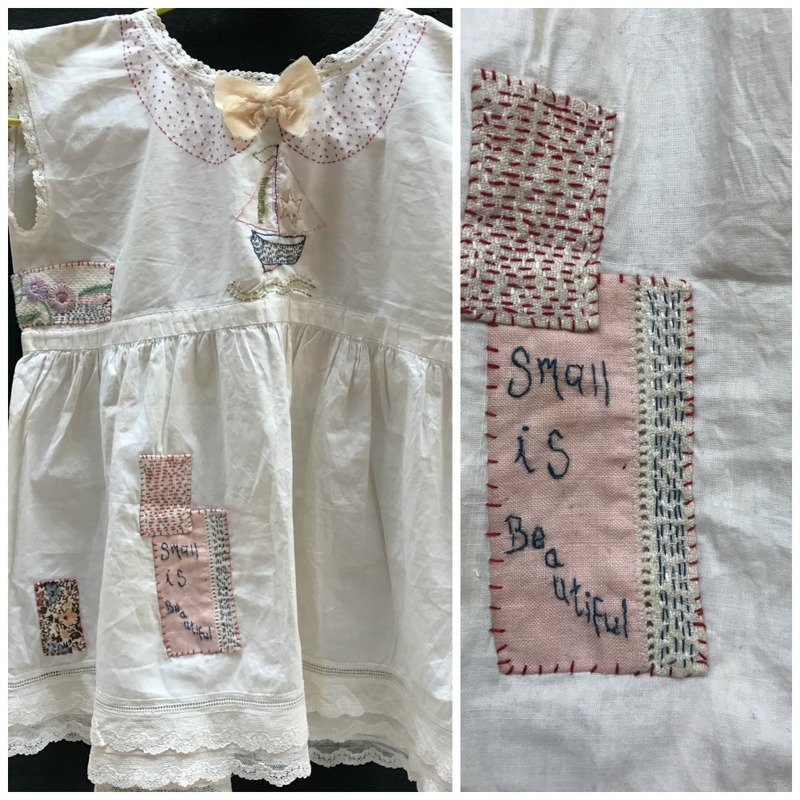 Her tiny stitches create whimsical script and her sweet color palette are so endearing. Her style is one of a kind. Jessie has a tiny shop in London. I wanted to go to her shop two years ago while in London but it was not open the day I could make it. So going to her shop this past May was top on our list. 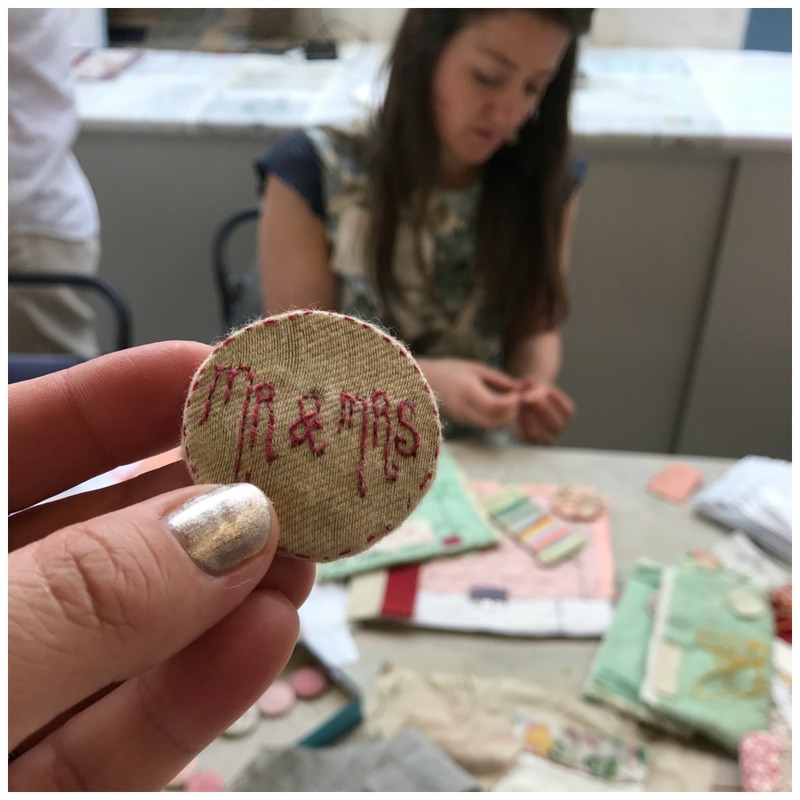 She has little stitching days in her shop with tea and I was hopeful we could make it BUT a workshop with Jessie Chorley would surpass even that!! Even better, the class was about creating a story on a quilt! I heard back from Louise the workshop had not opened yet and she assured me that we would have a spot. But still I didn’t tell mom. I wanted to be doubly sure so I waited until I it opened and I paid and got the confirmation email. I printed up the description and wrapped it up and drove over to moms. Yes I’m quite sure it was within the hour of receiving the email. I told mom it was an early Christmas present. When mom opened it and read it we both jumped up and down. Me a little more so but mom had the new hip and knee. Much celebration was put on by both. Have I built this up enough for you to know how excited we were to be going to this workshop? Well it didn’t disappoint. It was the most delightful day. We were both a tad nervous. When the email says, “we’ll put the kettle on at 9:40 and class starts at 10:00” it doesn’t sound too threatening. The studio was a little tricky to find but the directions included pictures so we found it with only one u-turn. We walked in and Louise said, you must be Katey and Dian. Not sure how she knew. ;) We were welcomed to a table and sweet Beth moved a chair down so mom and I could sit together. Mandy brought us a cup of coffee. We were here. All that anticipation and it’s here. One wall of the studio was windows looking out onto a courtyard. The tables were grouped into two big square tables for the students to sit and Jessie was at a long table at the front. She had her workspace looking so inspiring. And another table in the back with supplies for which we could pick anything that we wished to use. I can’t count the number of times mom and I looked at each other and smiled. 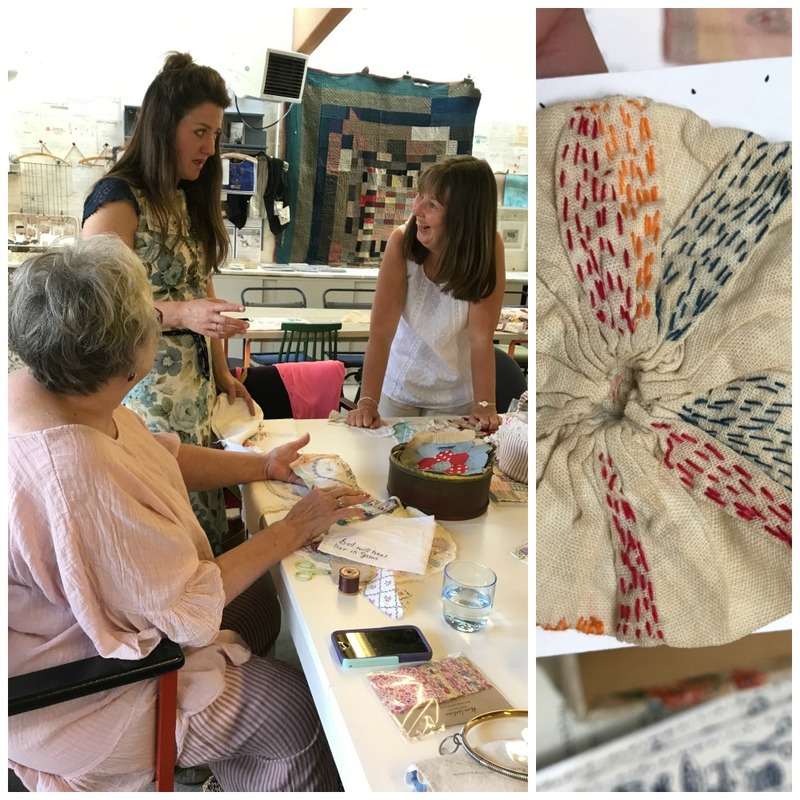 Stitching around a big table with English women who enjoy the same things we do, listening to their accents, sipping coffee, stitching beside my mom was just pure joy. I wanted time to stand still. These ladies were so kind. They talked of things that we would talk about, they laughed of things that we would laugh about. I wish I had recorded some of the canter. I wrote down a few things people said but my favorite….if it’s not bringing you joy don’t do it. If it’s not bringing you joy, don’t do it. Bears repeating don’t you think. I brought a tin full of old hand pieced “grandmother’s garden flower” pieces. I passed the tin around and let everyone pick a “flower” or two. I loved watching everyone at our table going thru the tin picking out their favorite colors or turning them over admiring the back and the stitches. I took the tin over to the second table and handed it to a lady sitting at the corner and told her to share it and pass around. Over the next hour one by one ladies from the second table would come over and personally thank me for sharing the pieces. Such sweet ladies! 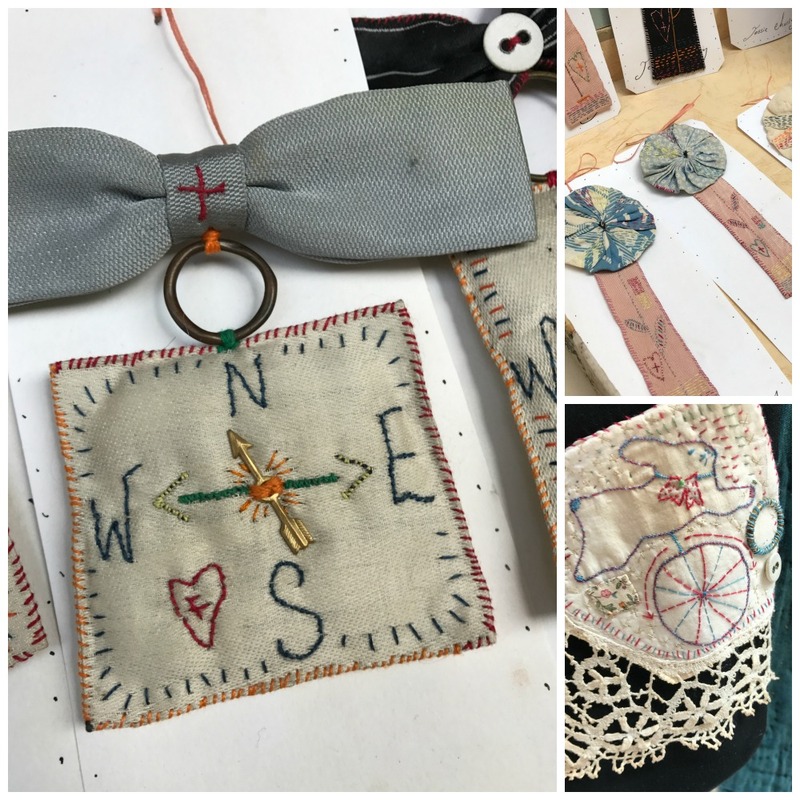 Jessie gathered us around every now and then to teach us a new stitch or how she covers buttons or how she plans out her piece then we would go back to our tables or to the stash table with a fresh cup of tea and work some more. The long table Jessie sat out was cleared at lunch and a delicious fresh from the garden lunch was brought in and we all sat together at the long table and ate together. We all lingered over lunch and slowly one by one we returned to our stitching. 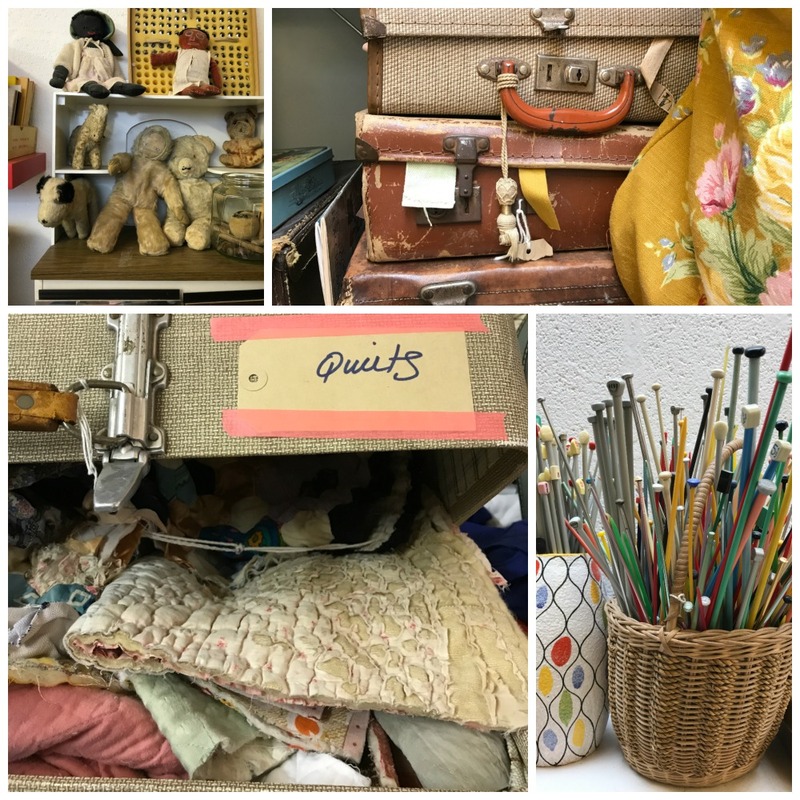 Jessie had brought pieces from her shop and patterns for sale. They were beautifully displayed. She also brought her sample books. 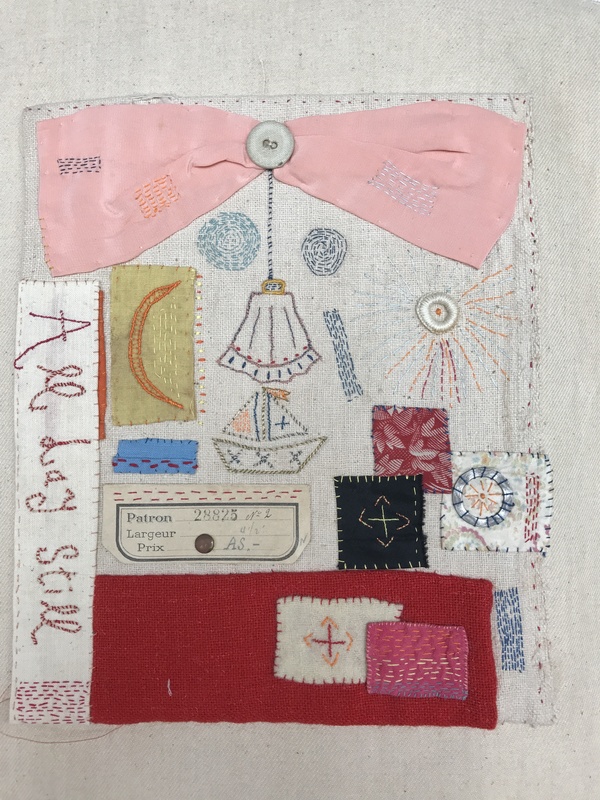 She stitched all her patterns and put them into a fabric book. Incredibly sweet to look through. I visited her “shop” corner several times looking at all her lovely things. I wanted to buy me a little piece of her art and couldn’t decide between two things. Hubby had sent me with a birthday gift of “guilt free spending”. How many things can I buy this trip that will qualify?? I settled on two pieces and still have them wrapped up because they are so sweetly wrapped. I feel like I will break the spell if I open them. Mom bought her friendship quilt pattern (pictured again below) and received it in the mail a few months later. She’s busy working on it. 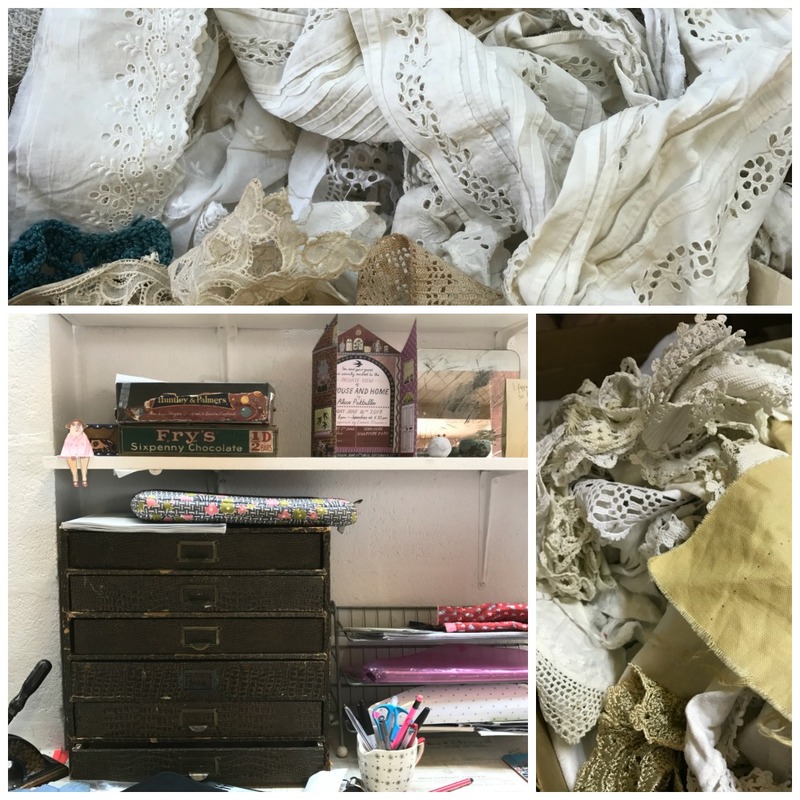 Louise, who owns the studio, has an amazing stash of goods and let me have a free snoop about and I found such amazing quilts, lace and embroidery works. I was quite happy poking around. 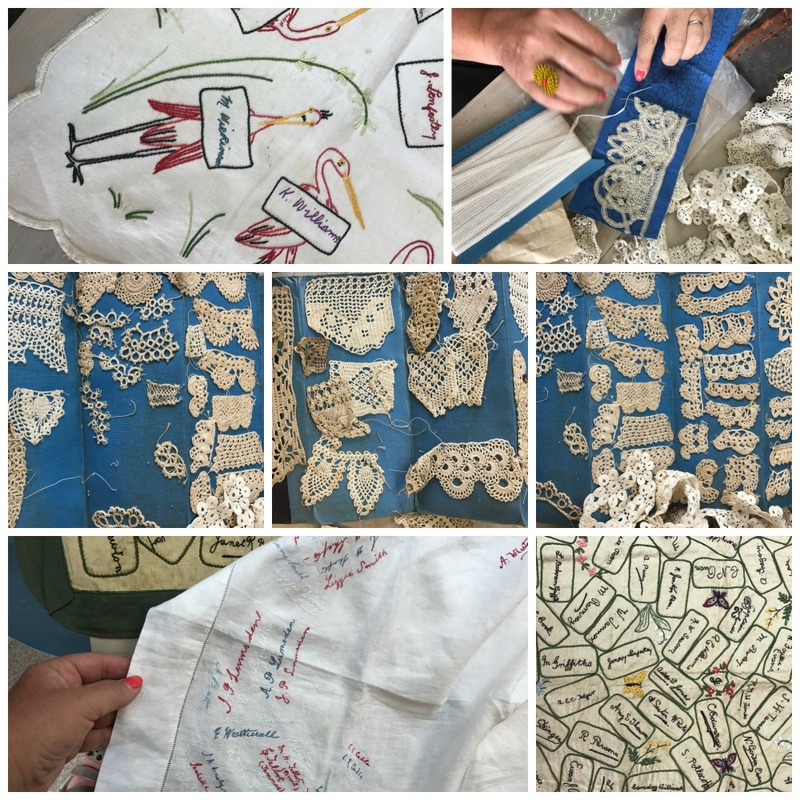 She had books of lace samples and we were discussing whether one was tatting or not and a fellow student quietly came up to the table and said she was a lace expert and inspected the piece and told us what type lace it was. I would LOVE to have spent a few hours with her learning more about them!! Louise gave me a handful of tatting lace as that’s my favorite as pay back for some quilting pieces I left with her. Love that! The studio had several artist work on display who hold workshops here. 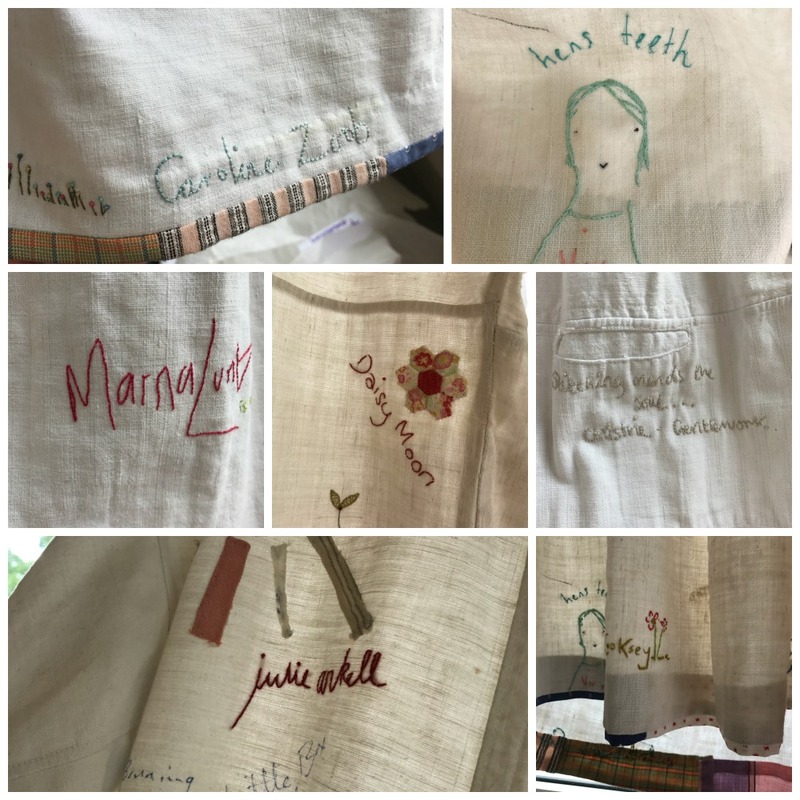 Hanging by the door was a cotton smock where all the artist had stitched their names. This was the neatest idea and I loved looking at it and recognizing several names of ladies who I admire and some I follow on Instagram. I tried to capture some pictures to share. Really neat! At the end of the day, we brought our pieces to the long table and everyone oohed and aahhed over each others work. Then we took turns telling about our piece. We took pictures and group pictures, exchanged some email addresses and slowly gathered our things up. It was an incredibly sweet day. It was all that I had hoped for. What could be better. Our drive back to our B&B in Newark was most satisfying as mom and I relived and relished all the details of the day. And in writing this so many months later renews my memories and brings back the joy of this special day. 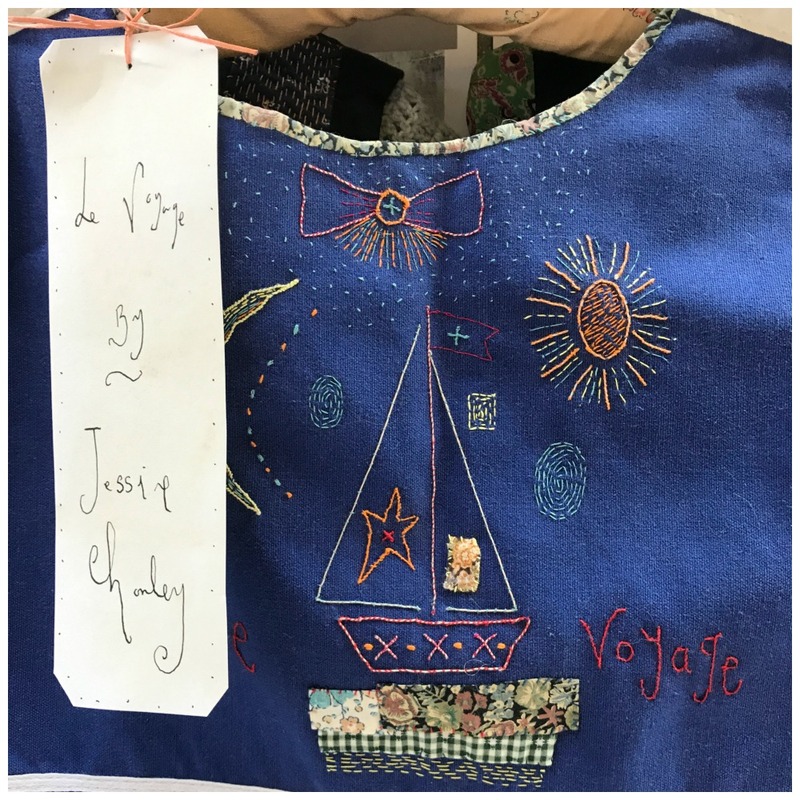 This entry was posted in mixed media, photography, travels, Uncategorized, vintage and tagged chorley, england, flea market, hope and elvis, jessie, newark, stitching, workshop by Katey. Bookmark the permalink. Enjoyed your story of that special opportunity so much! Could imagine the fun and fellowship of it… What a special trip event to look forward to sharing with your mom, and for you both to experience. The pictures are a great sample of the things you described. Thank you for sharing your met. Mom and I thought about you lots and lots. Oh my goodness!! Wonderfully said!! I am just sitting here with the biggest grin on my face!! Indeed it was just the perfect, perfect day!! Love your pictures and all the memories of our trip and getting to meet Jessie and sitting at her feet!! Most of all, thank you for arranging this forums to share! You are the best!! And I love you dearly!! Thank you mom. I loved reliving it again and again while writing. I love YOU dearly. What a wonderful experience…thank you for sharing all the photos! A dream come true!! Thank you. It was a dream come true. One that we had not even let be a dream! How much fun! 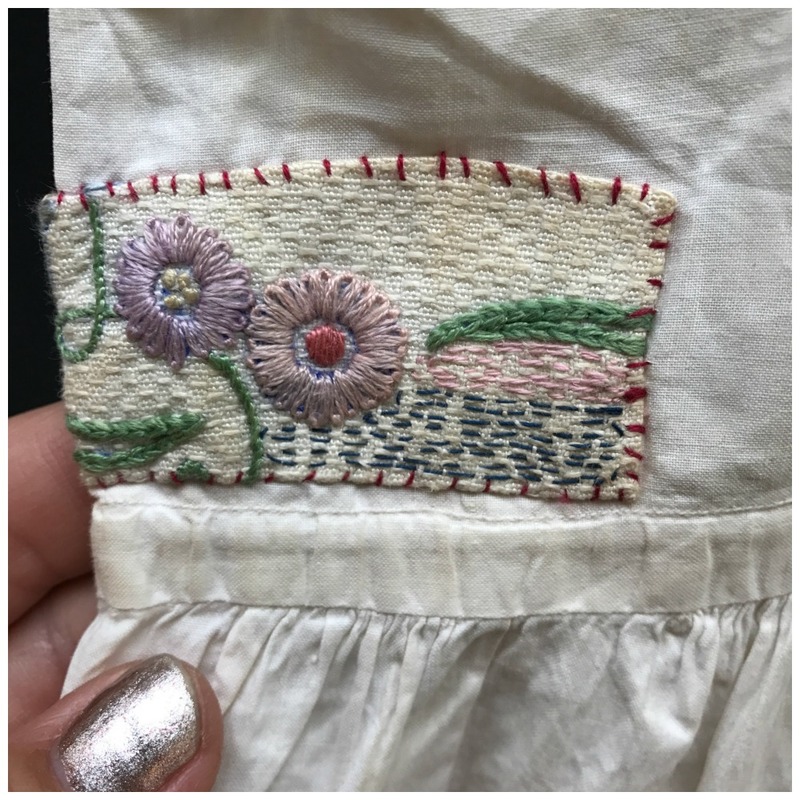 Loved the little stitched pieces. I wish you lived closer to me – I would so enjoy learning to do some of these sweet little pieces that look simple to do and that is what I need – SIMPLE! I LOVE EMBROIDERY ANYWAY. Love you too Katie, you are such a special young lady. May our Lord bless you always!